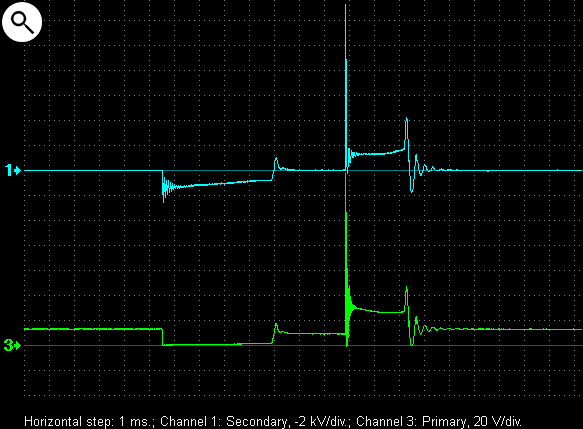 Voltage waveforms in primary and secondary circuits of a conventional distributor ignition system. 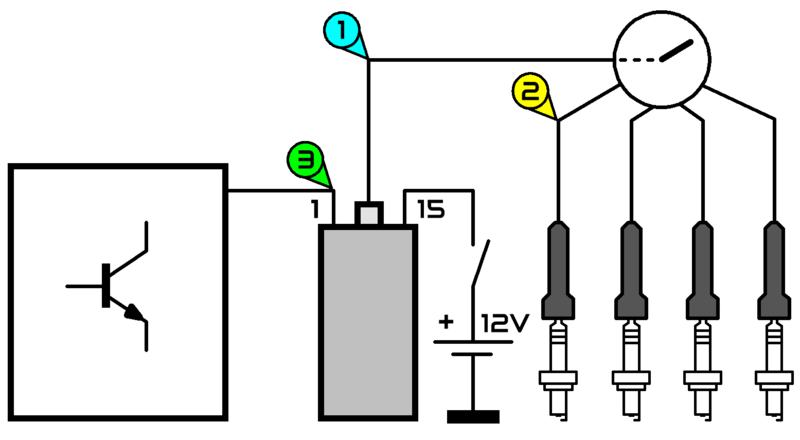 A conventional ignition system is defined as a system having a distributor and breaker points. 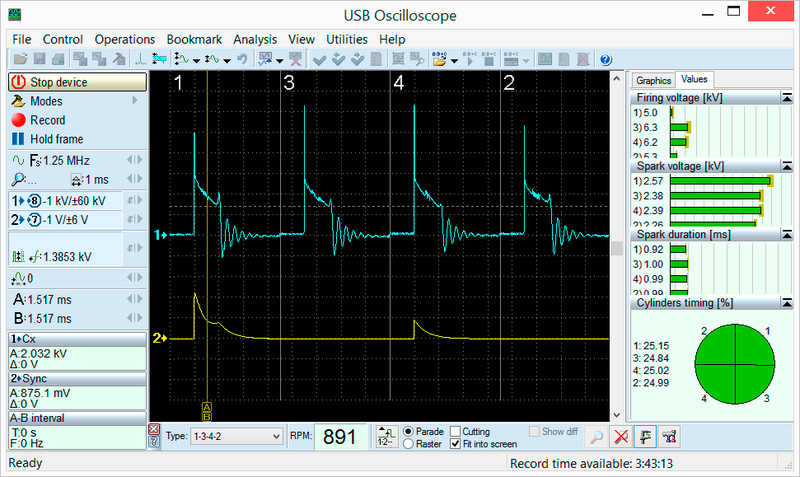 Voltage waveforms in primary and secondary circuits of a conventional electronic ignition system. A conventional ignition system is defined as a system having a distributor and the primary current flow is controlled by an electronic module or transistor. 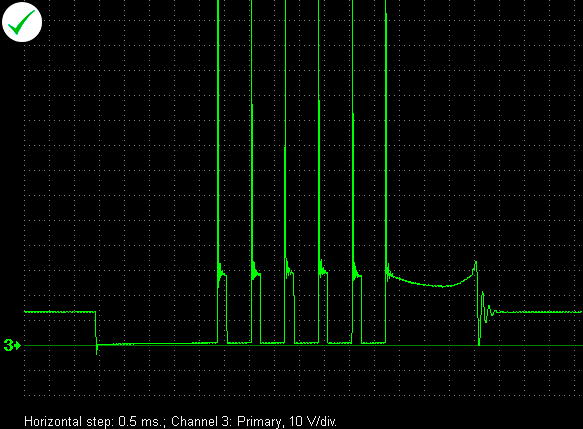 Voltage waveforms in primary and secondary circuits of a DIS ignition system. 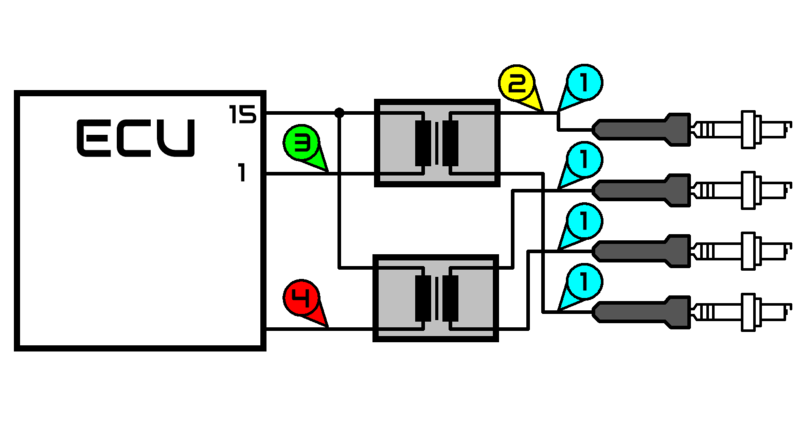 4 – primary circuit of the ignition coil for cylinders 2 3. 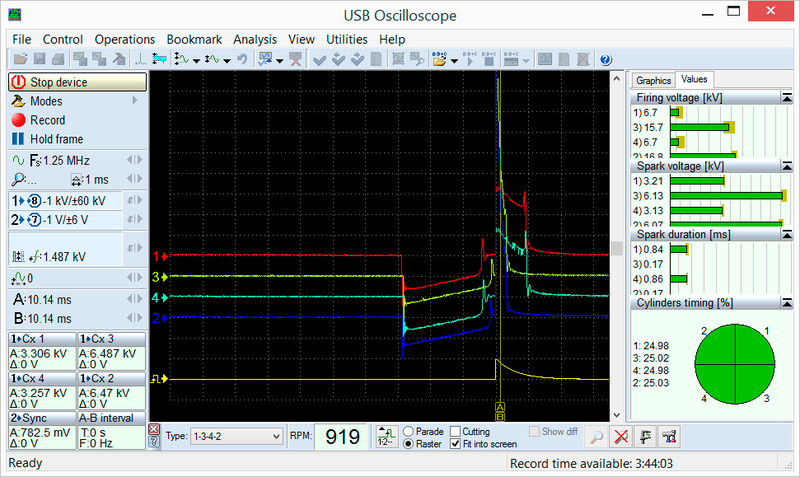 Coil on plug (COP) ignition system. 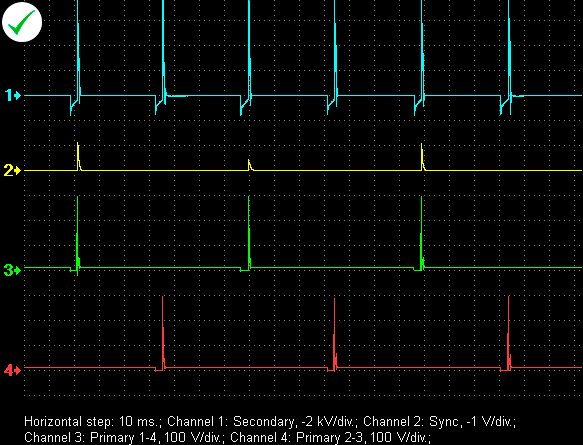 Voltage waveforms in primary and secondary circuits of a COP ignition system. 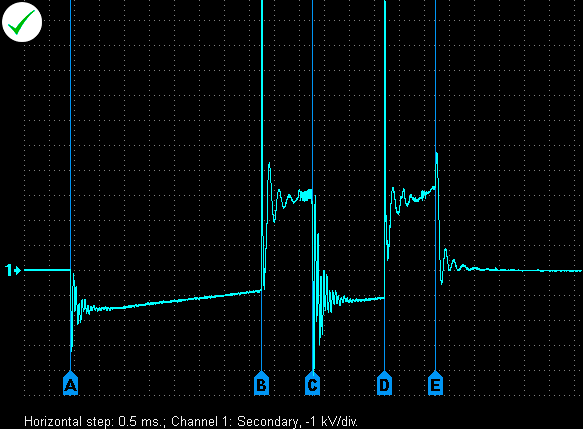 Characteristic points on the ignition waveform. 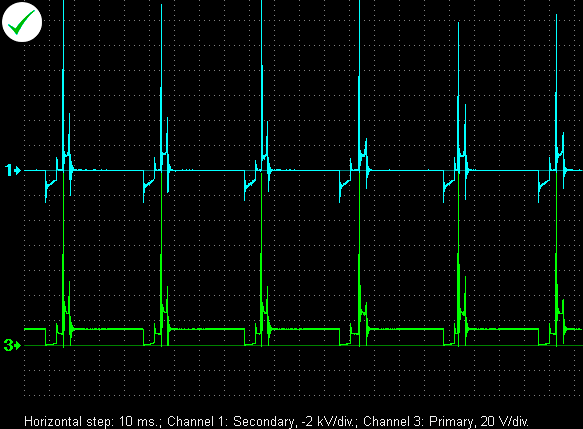 Ignition waveforms in the primary and secondary circuits. 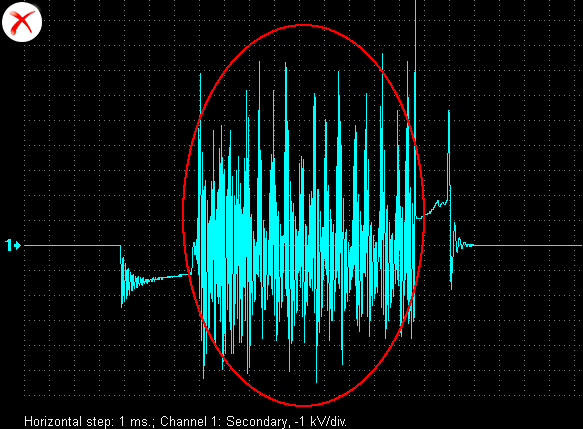 A – Coil primary current is turned on and the magnet field starts to build. 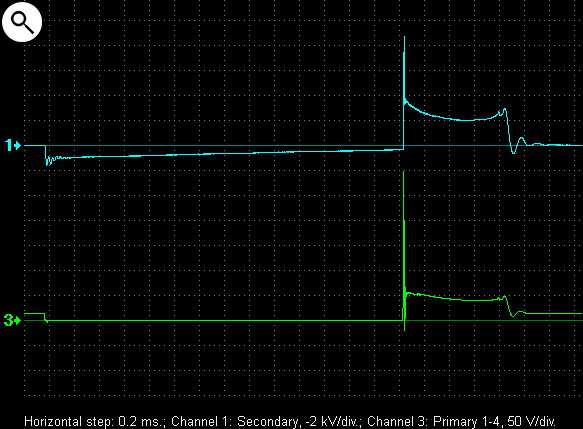 B – Current limiter point. 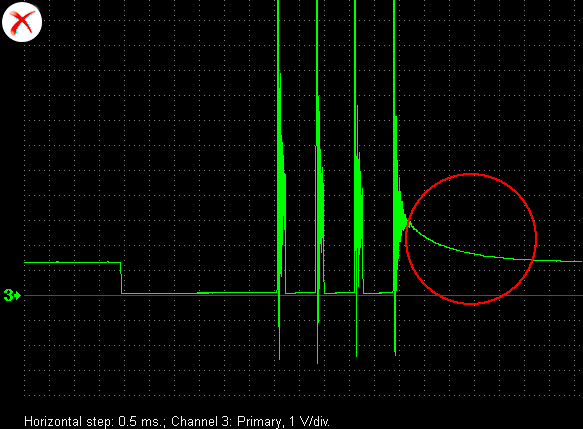 C – Firing line (Voltage required to ionize air/fuel mixture present in the spark plug gap. 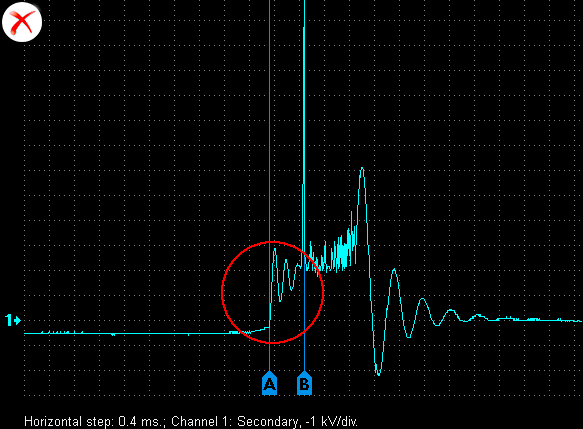 C-D – spark line (Voltage and duration of the actual arc). D- Spark is extinguished and the residual energy is dissipated in oscillations. Voltage waveform of multi-spark ignition system. C – Spark is extinguished, the primary current flow is restarted and the magnetic field builds again. E – end of the second spark. 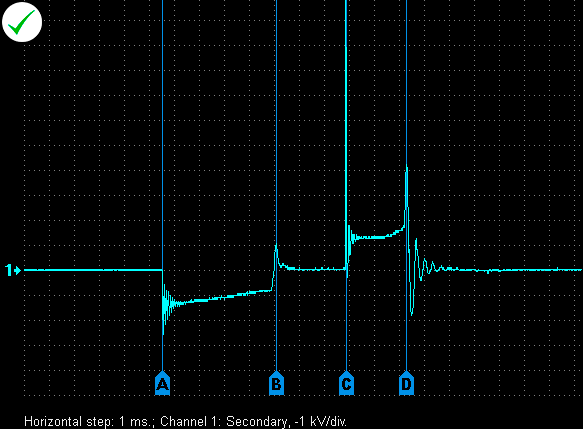 Voltage waveform in the primary circuit of a multi-spark ignition system (also called multi-strike). 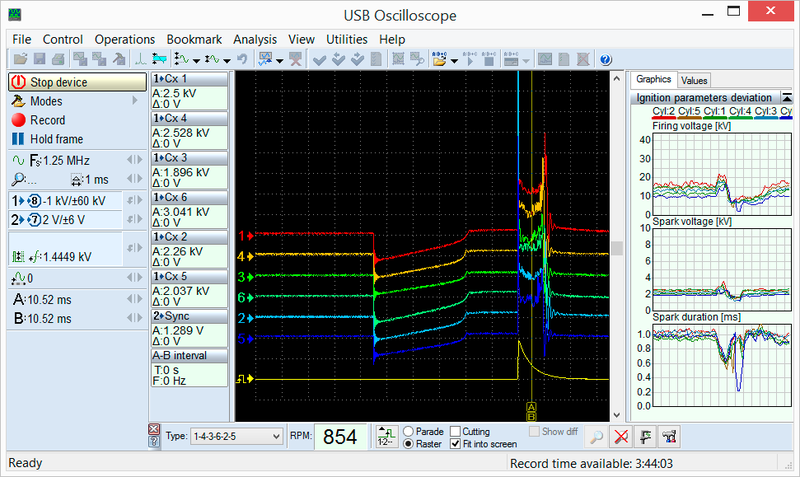 Displaying the high voltage waveform of an ignition system in the “Parade” mode showing the cylinder sparks in the firing order. In this case a 4 cylinder engine is displayed. 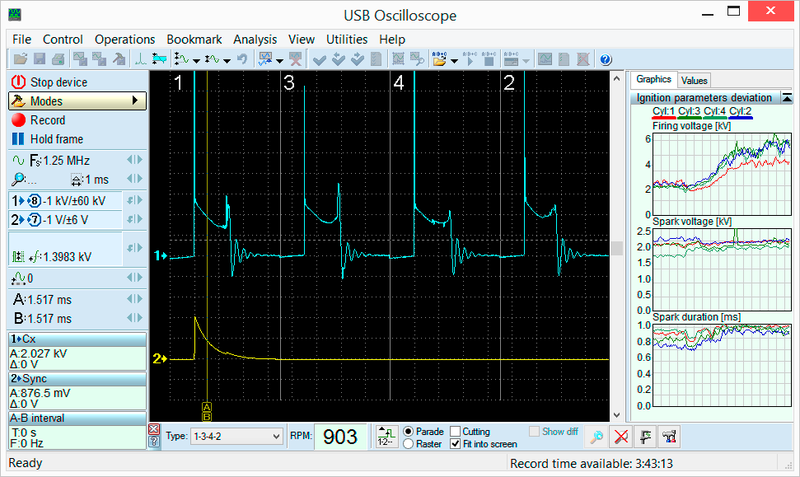 2 – 1st cylinder synchronization. 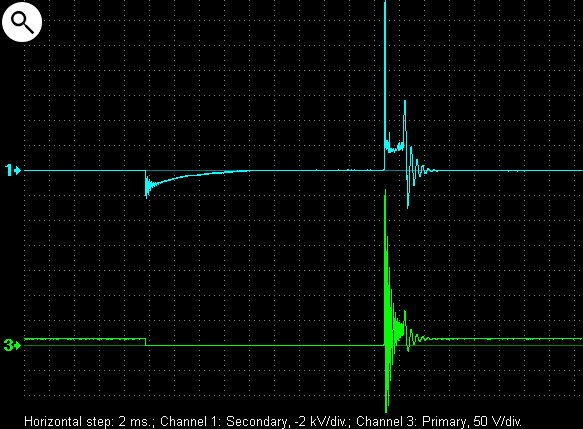 Voltage waveform in a secondary circuit of a conventional distributor ignition system. 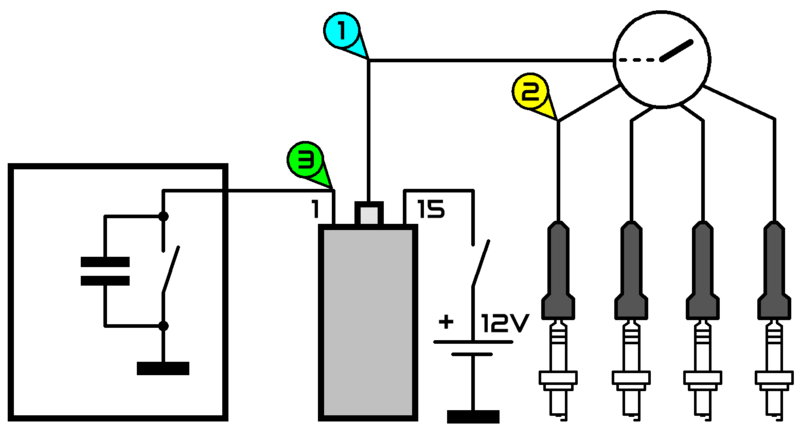 The capacitor (also sometimes called a condenser and used to extinguish the arc across the point contacts thereby stopping current flow much faster and allowing higher voltage to develop) circuit has high resistance or is open. B – The arc across the points is extinguished and normal spark occurs. 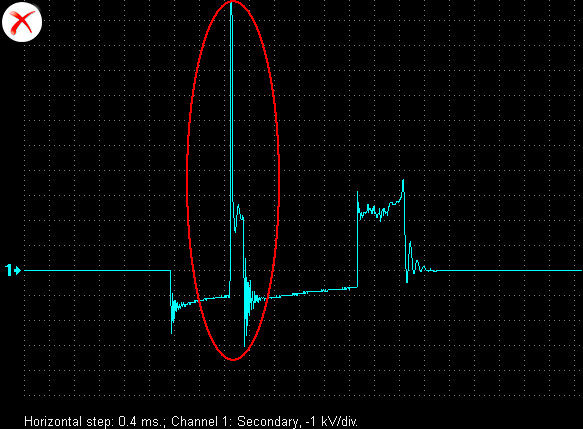 Voltage waveform in a primary circuit of a conventional distributor ignition system. 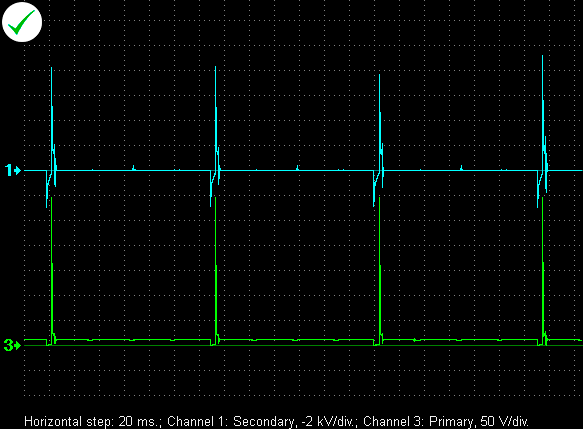 The capacitor has high resistance or is open. 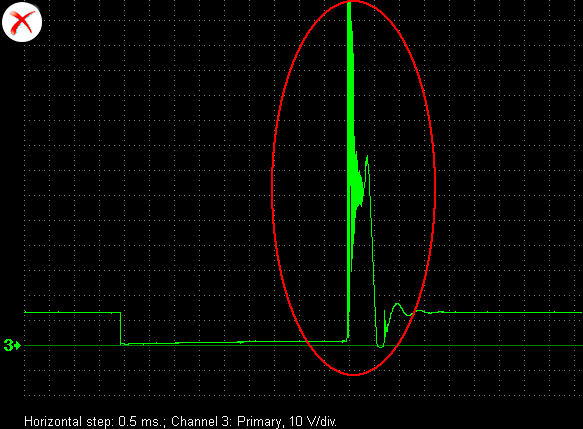 Voltage waveform in the secondary circuit of a malfunctioning ignition coil. The insulation of the high voltage winding is damaged. 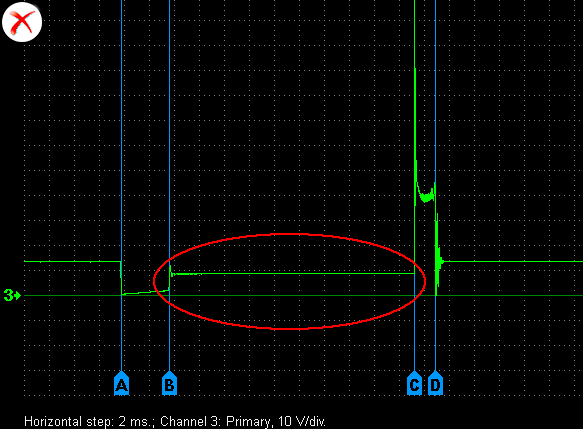 Voltage waveform in the primary circuit of a malfunctioning ignition coil. The insulation of the high voltage winding is damaged. 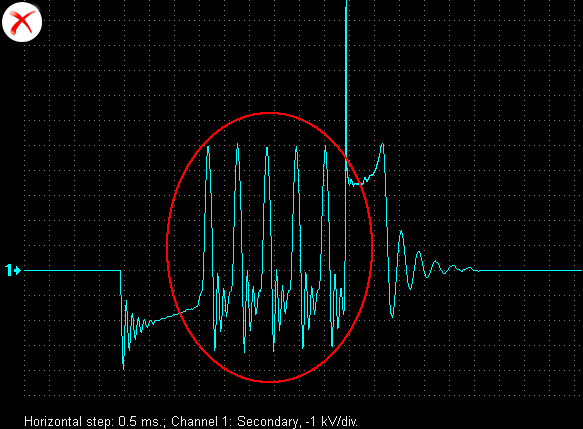 Voltage waveform in the primary circuit of a malfunctioning coil of a multi-spark COP system. The insulation of the high voltage winding of the ignition coil is damaged. 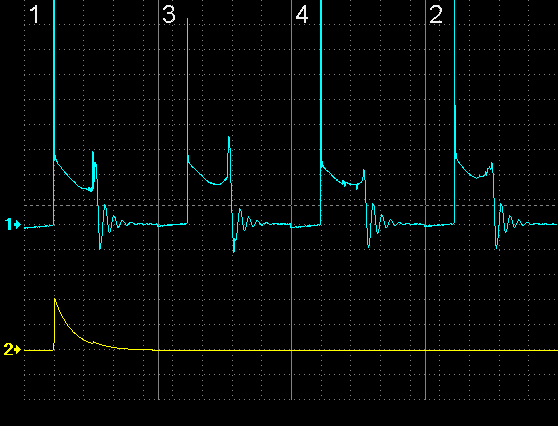 Voltage waveform in the secondary circuit of a malfunctioning ignition system. The resistance of the coil or plug wire is high. 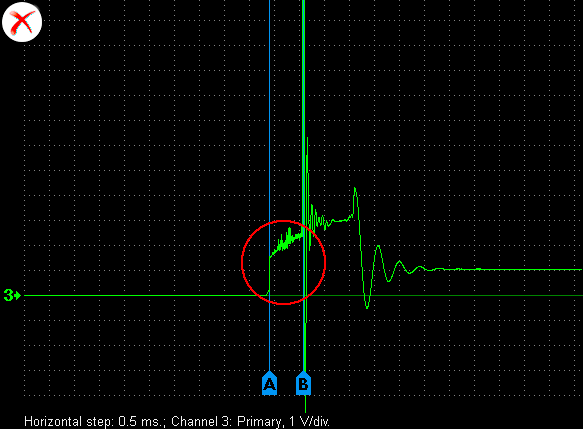 Voltage waveform in the primary circuit of a malfunctioning ignition system. 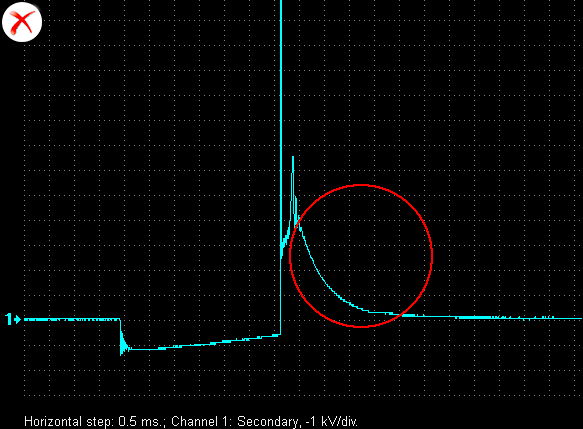 The resistance of the coil or plug wire is high. 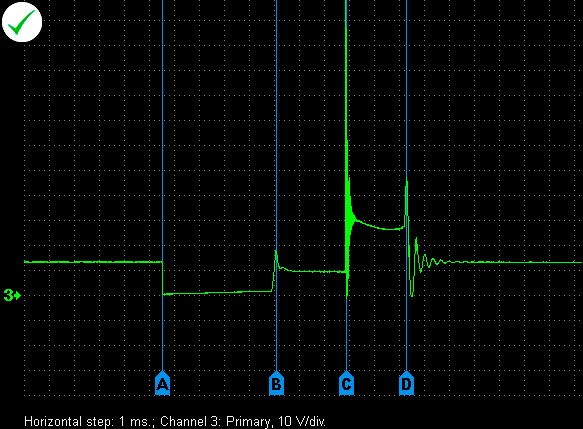 Voltage waveform in the secondary circuit of a malfunctioning ignition system. The spark plug is carbon fouled. 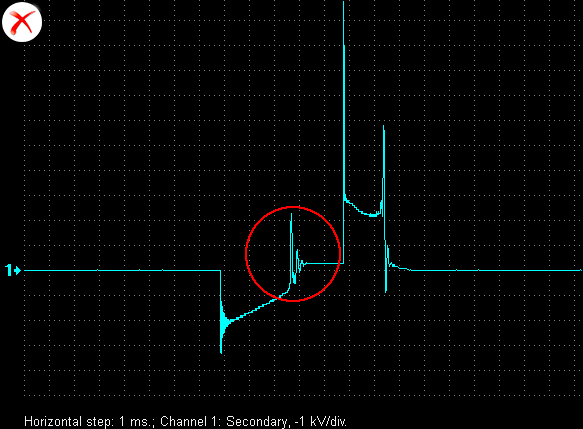 Voltage waveform in the primary circuit of an ignition system. 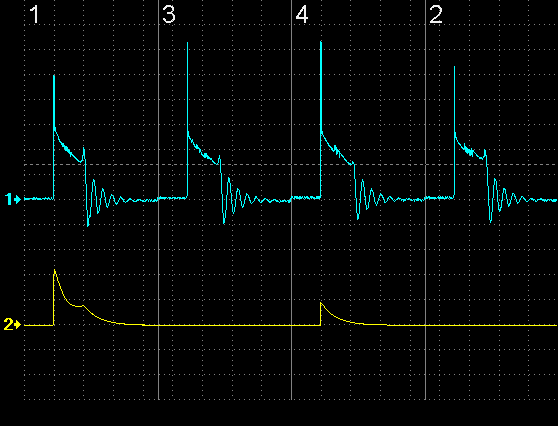 The ignition coil on time is too long. B-C – Current limiter line; on time is too long. 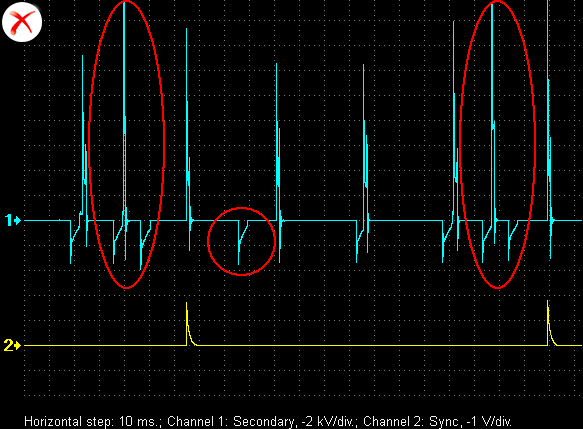 Voltage waveforms in the secondary circuit of an ignition system with a malfunctioning Ignition Control Module (ICM). 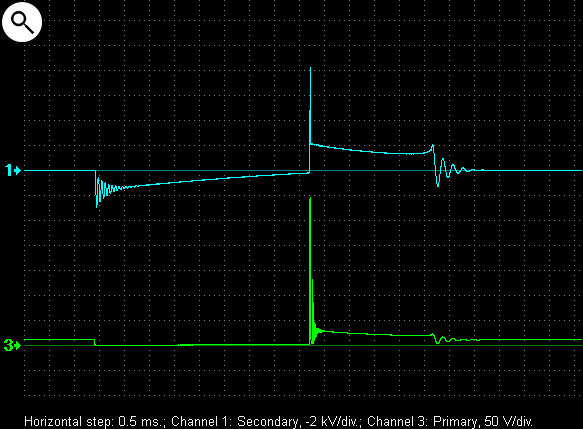 The current limiter in the ICM limits the current too abruptly. 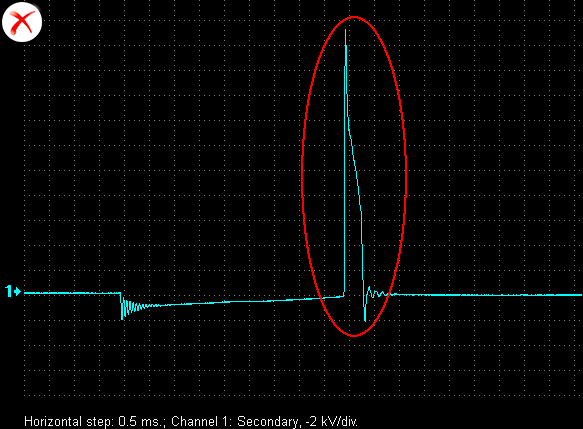 This may cause a spark to occur in the secondary circuit too early. This may cause engine damage. 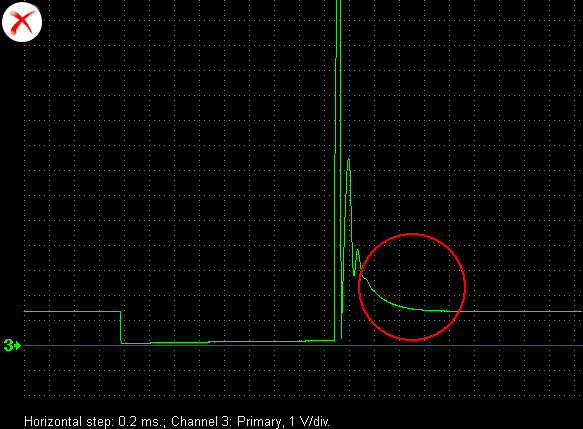 An example of an erroneous early ignition spark, caused by primary current interruption by a faulty ICM. 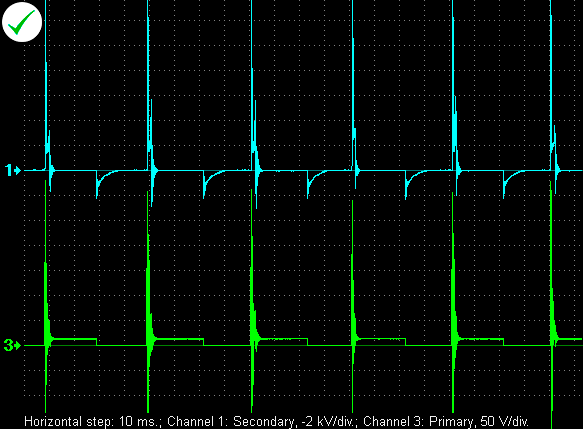 Voltage waveforms in the secondary circuit of an ignition system with a malfunctioning Ignition Control Module (ICM). 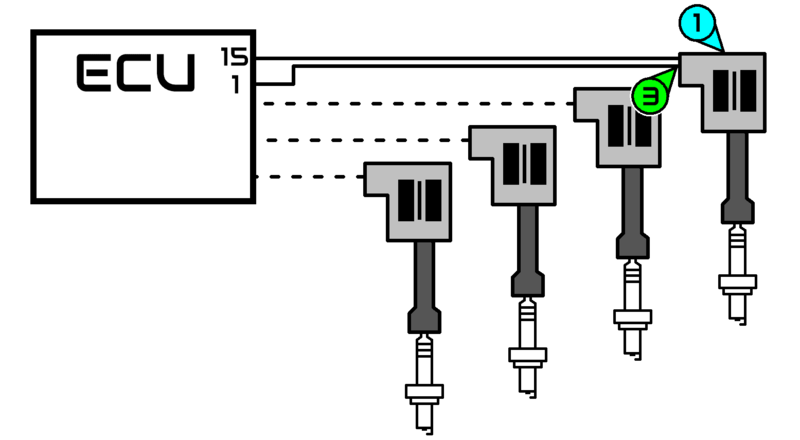 An example of an ignition system generating additional or misplaced ignition coil firing events due to erroneous signals from the camshaft position sensor.